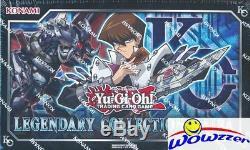 YUGIOH Legendary Collection KAIBA Factory Sealed 12 Box CASE! We are Proud to offer this Yugioh Legendary Collection Kaiba Factory Sealed CASE! This Factory Sealed CASE includes TWELVE(12) Yugioh Legendary Collection KAIBA Factory Sealed Boxes unlimited! Each One includes 3 MEGA BOOSTER PACKS, 5 PROMO +GAME BOARD! See complete Product Description Below. Kaiba is all about showing up his opponents with rare and powerful cards, so this Legendary Collection? S 105-card all-foil Mega Pack set includes many sought-after tournament level cards to bolster your Deck! You can find game-changing spells like Card of Demise as well as a slew of infectious traps like Crush Card Virus; even popular "hand traps" like Ghost Ogre & Snow Rabbit, Droll & Lock Bird, and more! With four different artworks of Blue-Eyes White Dragon, you can hunt for the perfect set... And even tear up the fourth to make sure no one else can! In addition, Legendary Collection Kaiba includes 5 brand-new cards inspired by famous entries in Kaiba's arsenal. Has a new incarnation that paves the way for mighty Dragons by finding powerful spells to herald their arrival! Alongside it, a radical rhapsody in opposite tune of The Flute of Summoning Dragon can help resurrect your fallen Dragons to the field! Even Ring of Destruction gets a new twist that? S a little less explosive, but will surely detonate any chance your opponent has in the long game. Topping it off in the Legendary Collection tradition is a hard-back, fold-up Game Board with a complete 1-player Duel Field on one side and an unbordered Kaiba art version on the other. Each Legendary Collection Kaiba box set contains:? 3 Legendary Collection Kaiba Mega Packs. S no way that Kaiba would settle for normal Mega Packs, so each of these Mega Packs contains 4 Secret Rares and 6 Ultra Rares for a total of 10 foil cards per pack that? S 30 cards per box! 5 new cards based on some of Kaiba? S famous cards, including a new Fusion Monster to Summon with The Fang of Critias! 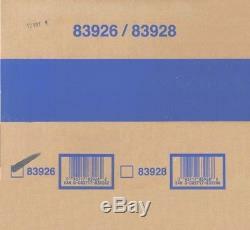 We stock a Huge Selection of Factory Sealed Boxes from every Sport! Plus the Largest Collection of Graded Cards in the World! Be Sure to Check out our 1,000? S of other Items for Sale. Wait to pay until all items have been won OR 7 days after oldest item was won. (Please Note - we are not open on the Weekends and Holidays). We will NOT list a lower value or mark orders as gifts. - Vendio Counters are active content free. The item "YUGIOH Legendary Collection KAIBA Factory Sealed 12 Box CASE! On Fire" is in sale since Wednesday, May 16, 2018. This item is in the category "Collectibles\Non-Sport Trading Cards\Other Non-Sport Card Merch". The seller is "wowzzer" and is located in Irvine, California.